Algae being cultured in different salinity conditions at lab scale. Anbarasu Karthikaichamy, a research scholar with the IITB-Monash Research Academy, loves to narrate the fable about the king and salt. The one where the king once asked his daughter how dear he was to her, to which she replied as dear as salt, and how this angered him no end, till the princess invited him to a feast where every dish lacked salt, and how he then realised the importance of this seemingly insignificant mineral in our lives. “Salt and algae might appear to be unlikely bedfellows, but algae can grow in highly saline conditions,” chuckles Anbarasu, whose PhD project is titled, ‘Generating gene expression tools for algal molecular manipulation’. So what got this gold medalist from Anna University, Chennai interested in this field? 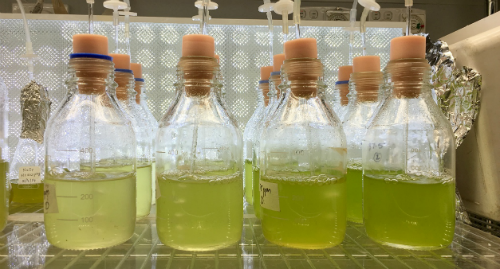 Algae, as a third-generation bio-fuel producer, requires relatively little space compared to its well evolved counterparts (plants). Besides, it can grow in a variety of conditions (including in a saline water body), consuming carbon dioxide much more efficiently than land plants. Anbarasu is closely studying the physiological changes that occur in algae during increased saline conditions. “I will be collecting algae samples in different conditions (depending on the interest of regulation points—like growth stages, sunlight intensity, heat, etc. ), freezing them, and analysing the mRNA (messenger RNA) and protein levels. This should provide clues to isolate promoters for the genes of interested regulations,” he says. The IITB-Monash Research Academy is a collaboration between India and Australia that endeavours to strengthen scientific relationships between the two countries. Graduate research scholars like Anbarasu study for a dually-badged PhD from both IIT Bombay and Monash University, spending time at both institutions to enrich their research experience. Figure 2. Anbarasu loves to generously salt his algae to get the maximum flavour. Only an ignoramus would take such a study with a pinch of salt! Supervisors: Prof Santosh Noronha, Prof Sanjeeva Srivastava, Prof Dieter Bulach, Prof Ross Coppel and Dr Santanu Dasgupta.